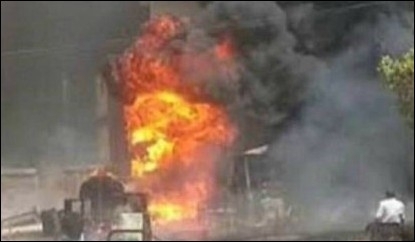 The bombing of St. Peter Cathedral in Cairo on December 11 left at least 25 people dead. The worst attack on Egypt's Christian minority in recent years occurred yesterday, Sunday, December 11, 2016. 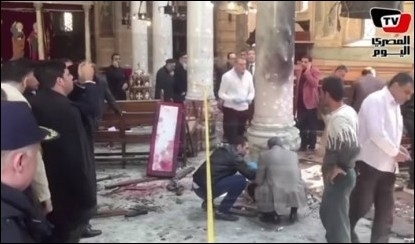 St. Peter Cathedral in Cairo, packed with worshipers celebrating Sunday mass, was bombed; at least 25 churchgoers, mostly women and children, were killed and 65 severely wounded. As many of the wounded are in critical condition, the death toll is expected to rise. As usual, witnesses say that state security was not present, and that police took an inordinate amount of time to arrive after the explosion. Preliminary investigations point to a bomb placed inside an unattended woman's purse on one of the rear pews of the women's section. Mutilated bodies were strewn along the floor of the cathedral. "I found bodies, many of them women, lying on the pews. It was a horrible scene," said one witness. "I saw a headless woman being carried away," said Mariam Shenouda. "Everyone was in a state of shock. We were scooping up people's flesh off the floor. There were children. What have they done to deserve this? I wish I had died with them instead of seeing these scenes." In death toll and severity, this attack surpasses what was formerly considered the deadliest church attack in Egypt -- a New Year's Day bombing of a church in Alexandria that killed 23 people in 2011. The interior of St. Peter Cathedral in Cairo, after the bombing. Yesterday's attack was also symbolically more significant: St. Peter's Cathedral stands alongside and is used by St. Mark's, the seat of Egypt's Coptic Orthodox Christian church and home to its leader, Pope Tawadros II. It is to President Sisi's shame that the deadliest church attack in Egypt occurred on his watch. Yet it is also not surprising, considering how little has really changed for Egypt's Christians since Sisi ousted Morsi and the Muslim Brotherhood from power in 2013. Although Western media outlets do not report them, there have been several unsuccessful terror attacks on churches in Egypt in recent weeks and months. Last November, a man hurled an improvised bomb at the entrance of St. George Church in Samalout, Egypt. Had the bomb exploded (it was dismantled in time), casualties would have been high, as the church building was packed with thousands of worshipers congregating for a holiday. Instances of angry Muslim mobs attacking and killing Christians on the mere rumor that they are trying to build a church, or are meeting to pray in a house church, are also on the rise. Last summer in Minya -- the same place where a 70-year-old Christian woman was stripped naked, savagely beaten, spat on, and paraded in the streets to jeers, whistles, and yells of "Allahu Akbar" -- rioting Muslims burned down 80 Christian homes on the rumor that Christians were trying to build a church. "No one did anything and the police took no pre-emptive or security measures in anticipation of the attacks," said Bishop Makarios. He is also on record as saying that Christians are attacked "every two or three days" in Minya, and that the authorities are always turning a blind eye, if not actually aiding or enabling the attacks. 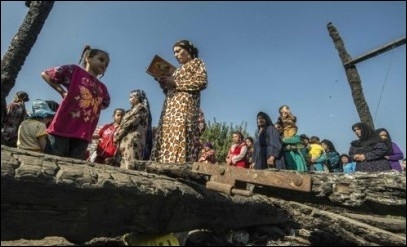 Egyptian Christians in the village of Ismailia attend mass last July in the ruins of a makeshift chapel burned down earlier in the year. Even the much-touted new law that purports to allow Christians to build churches has been criticized by Christian clergy, activists, local human rights groups, and Christian members of parliament. They say it still continues to discriminate against Christians, including with security provisions that subject decisions on whether or not a church can be built to the whims of violent mobs. Recently, in the village of Naghameesh, the building Christians were using to hold church services was torched by angry Muslims. Afterwards, a "reconciliation meeting" was held by top officials. As usual, the "brotherhood of all Egyptians" -- Christians and Muslims -- was highlighted, but when it came to the question of giving their fellow Christian brothers the same right to worship that Egypt's Muslims enjoy, the majority of Muslim leaders and family members refused to permit the local Christians a place to worship. Authorities did nothing to support the Christians. "We don't understand what is so dangerous about the Copts praying and exercising their legal rights in this matter," one local Christian said. Adding insult to injury, the Egyptian government just boasted last week that it is opening 10 new mosques every week; that there are 3,200 closed mosques that need renovating, and that the government is currently working on 1,300 of them; that it will take about 60 million Egyptian pounds ($3.3 million USD) to renovate them, but that the government has allotted ten times that much, although a total of three billion Egyptian pounds is needed; and that the Egyptian government is dedicated to spending that much -- for "whoever abuses public funds [meant for Islamic worship], enters a war with Allah." This was announced by Dr. Muhammad Mukhtar Gom'a, Minister of Awqaf, or endowments. But when the nation's more than 10 million Christian minority seeks to build a church -- and pay for it from their own pockets -- all is woe in Egypt. Little has changed for Egypt's Christians since Sisi took power in 2013. That nothing has changed for Egypt's Christians was even asserted by Sheikh Ahmed al-Tayeb, the nation's highest Muslim authority and Grand Imam of Al Azhar University, the Sunni Muslim world's most prestigious madrassa in Cairo. During a recent televised interview, al-Tayeb defended Al Azhar's reliance on books written in the Medieval Era, which reformers are eager to see eliminated from the school's curriculum because they support the most radical expressions of Islam -- including killing apostates, burning infidels, and persecuting Christians. Al-Tayeb further mocked the notion of "changing religious discourse" -- a phrase made popular by Egyptian President Abdel Fattah el-Sisi, who in 2015 called on Al Azhar and its top instructors to reform their teachings. Although al-Tayeb appeared sitting in the front row during el-Sisi's speech, he is now dismissing it. "Al Azhar doesn't change religious discourse -- Al Azhar proclaims the true religious discourse, which we learned from our elders," said Egypt's highest Muslim authority. Moreover, the law that the elders of Islam -- the ulema -- bequeathed to Egypt's Muslims, holds that all conquered indigenous inhabitants -- in Egypt, the infidel Christians -- must not be permitted to build churches, must not complain or ask for equal rights, and must be grateful merely for being allowed to live. In short, not only has nothing changed for Egypt's Christians; the deadliest church attack in modern history has now just taken place, not under Mubarak or Morsi, but under President al-Sisi. What does he propose to do about it? Among the rioters were women and children shouting "Allahu Akbar!" and "We'll burn the church, we'll burn the church." Even though Muslims were attacking Christians, Egyptian television portrayed it as a "sectarian clash." After arriving, the police stood back and allowed the mob to continue rioting, plundering and setting more Christian homes and vehicles on fire. The Muslims then performed their afternoon prayers outside those Christians' homes they had not destroyed -- with loudspeakers pointed at their doors.